There are reports surfacing on Twitter of a possible shooting at LAX. LOS ANGELES (AP) — A man carrying a note that said he wanted to "kill TSA" pulled a semi-automatic rifle from a bag and shot his way past a security checkpoint at Los Angeles International Airport on Friday, killing one Transportation Security Administration officer and wounding two others, authorities said. The gunman was wounded in a shootout with airport police and taken into custody, authorities said. His condition was not disclosed. The attack at the nation's third-busiest airport sent terrified travelers running for cover and disrupted more than 700 flights across the U.S., many of which were held on the ground at LAX or not allowed to take off for Los Angeles from other airports. The TSA late Friday identified the slain officer as Gerardo I. Hernandez, 39. He is the first TSA officer killed in the line of duty in the 12-year history of the agency, which was founded in the aftermath of 9/11. 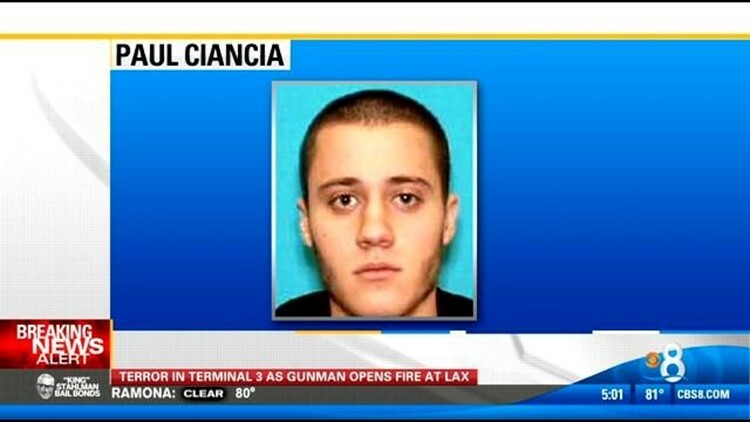 The FBI and Los Angeles Airport Police identified the gunman as Paul Ciancia, 23, of Pennsville, N.J. He had apparently been living in Los Angeles. A law enforcement official, speaking on condition of anonymity because the person was not authorized to discuss the investigation publicly, said Ciancia was wearing fatigues and carrying a bag containing a one-page handwritten note that said he wanted to kill TSA employees and "pigs." The official said the rant refers to how Ciancia believed his constitutional rights were being violated by TSA searches and that he's a "pissed-off patriot" upset at former Department of Homeland Security Secretary Janet Napolitano. The note and the gunman's rifle each had an orange TSA inspection sticker on it. Ciancia had at least five full 30-round magazines on him, said the official, who was briefed at LAX on the investigation. The official said Ciancia was shot in the mouth and leg by two airport police officers. Another official briefed on the incident at LAX who could not speak publicly said the gunman had been shot four times but was "stable" when he was transported to the hospital. Early Friday afternoon, Ciancia's father in New Jersey had called authorities for help in finding his son after the young man sent one of his siblings a text message about committing suicide, Pennsville Police Chief Allen Cummings said. The chief said he called Los Angeles police, which sent a patrol car to Ciancia's apartment. There, two roommates said that they had seen him Thursday and that he was fine, according to Cummings. Cummings said that the Ciancias — owners of an auto body shop — are a "good family" and that his department had had no dealings with the son. The attack began around 9:20 a.m. when the gunman pulled an assault-style rifle from a bag and began firing inside Terminal 3, Airport Police Chief Patrick Gannon said. The terminal serves such airlines as Virgin America, AirTran, Spirit Airlines, Horizon Air and JetBlue. The gunman then went to the security screening area, where he fired more shots and went into the secure area of the terminal, Gannon said. Officers exchanged fire with him and seized him, Gannon said. As gunfire rang out, panicked travelers dropped to the ground. Those who had made it past security ran out of the terminal and onto the tarmac or took cover inside restaurants and lounges. "We just hit the deck. Everybody in the line hit the floor and shots just continued," said Xavier Savant, who was waiting in the security line where the shooting took place. He described it as a "Bam! Bam! Bam!" burst of gunfire. Savant said people bolted through the metal detectors and ran into the terminal. "My whole thing was to get away from him," said Savant, an advertising creative director who was heading to New York with his family for a weekend trip. Just a few weeks ago, airport police and the Los Angeles Police Department had jointly trained for a similar shooting scenario, according to Gannon, who said officers told him the drill was critical in preparing them for the real thing. While Terminal 3 remained closed, much of the rest of the airport continued operating, though with some disruptions. Some LAX-bound flights that were already in the air were diverted to other airports. The ripple effect across the country delayed 76,000 travelers, LAX officials said. Hundreds of stranded passengers streamed into nearby hotels, rolling bags behind them down roads absent of car traffic. The officer who was killed was one of the behavioral detection officers that are stationed throughout the airport, looking for suspicious behavior, said J. David Cox Sr., national president of the American Federation of Government Employees. Initially, Cox said at least three other TSA officers were wounded. Later in the day, the TSA said two other officers were wounded. Their conditions were not disclosed. The Los Angeles Fire Department revised its total number of victims taken to hospitals from six to five, saying one had been double counted. Those numbers included Hernandez, Ciancia and one person who broke an ankle. Ben Rosen was sitting at a Starbucks in the terminal eating oatmeal when he heard gunfire erupt and saw people running in all directions or crouching. He grabbed his phone and tried to lie as flat on the ground as he could. Police showed up with guns drawn, shouting, "This is not a drill! Hands up!" People put their hands up and then were led out of the terminal to the adjacent international terminal, Rosen said. As they were led out they saw broken glass from a window that looked as if it had been shot out. Rosen left his bag behind. It was not the first shooting at LAX. On July 4, 2002, a limousine driver opened fire at the airport's El Al ticket counter, killing an airline employee and a person who was dropping off a friend at the terminal. Police killed the man. Contributing to this report were Associated Press writers Joan Lowy and Alicia Caldwell in Washington; Greg Risling, Christopher Weber, Alicia Chang, Alicia Rancilio, Gillian Flaccus and Michael R. Blood in Los Angeles; Josh Hoffner in Phoenix; and Michael Rubinkam in Pennsylvania.